Funeral Rights explores the increasing popularity for alternative funerals. The film presents the rising trend to turn away from traditional and conventional ceremonies and investigates exactly what alternative choices are available and just why many, are now seeking the chance to take control of their own funeral and final goodbye. There are 7 short 4 minute clips to watch (click more) and in this first clip the contemporary option of a “return to nature” through a burial in a nature reserve or woodland is explained. Influenced by personal accounts from former slaves, this short film depicts a fictional account of the life of an African slave. Through the eyes and voice of a relative the film presents the harrowing journey of an African slave, like so many captured and forced to leave his home, and travel to his new enslaved life on a Caribbean plantation. Produced by Media19 for Tyne and Wear Archives and Museums. Facing the Music investigates the allure of learning to play a musical instrument for all generations. Following the ambitious, young violinist Sophie as she prepares for her first orchestra lead performance, the film explores the hard work and dedication required to master a musical instrument along with the chores and triumphs that playing can bring. The BBC and Ridley Scott’s production company are launching a new film-making project ‘Britain in a Day’ to be filmed by the people of Britain themselves. This historic project aims to provide a time capsule of what life is really like in Britain on 12th November 2011, filmed by the people who live there. Media19 have been involved in hosting regional workshops to support people from the North East to film aspects of their daily life, whether ordinary or special and contribute to a picture of Britain today. We will also be supporting people on the day of filming, whether it’s their favourite hobby or activity, their usual Saturday routine or their entire day! Once the films have been shot we will also be on hand for anyone requiring help to upload their films to YouTube between the 12th November-21st November. Dame Clare Tickell met young parents from Ashington in Northumberland and Barrow in Furness, Cumbria at the opening of an exhibition of their work produced for the WE ARE HERE project at the 12 Star Gallery, Europe House, Smith Square, Westminster, London. 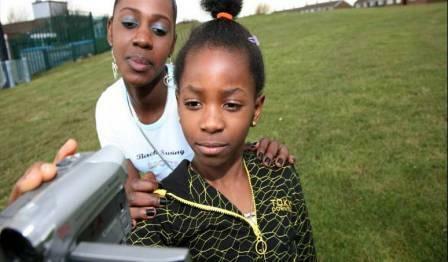 Working with Media19 they have produced their own short films that reflect on their experiences as teenage mums and the challenges they face. Their work is being shown alongside that produced for the project from Serbia and Hungary. We Are Here is our latest project producing a pan-European initiative with partners in Hungary, Serbia and Italy that brings together people who are facing challenges, struggles, barriers or discrimination in their everyday lives. In a creative partnership with artists and digital media producers they are producing creative and insightful self-portraits – films and visual statements about their lives and circumstances, their hopes, aspirations, experiences, pasts and futures. At a special event at the City Library in Newcastle, young parents from Northumberland, Teesside, Cumbria and the Yorkshire regions came together to promote their unique public awareness and peer education campaigns for Media19s pan-European project We Are Here / Campaign Trail UK to deliver their powerful and intimate messages about what it means to be a parent when you are a teenager. DiGi50+ is a new initiative supporting people living in rural communities to get more out of computers, the internet and being online. Tommy Hair, who died suddenly last week whilst filming in Bangladesh for Sport Relief, was a great friend, colleague and hugely talented sound engineer who worked with Media 19 alongside Director/Cameraman Nick Oldham and Producer Belinda Williams on virtually all of Media 19’s productions. His contribution to our work has been considerable. Tommy was such a generous, kind and considerate person with a brilliant sense of humour and an unrivalled ability to make everyone feel at ease. As a sound recordist, Tommy was able to work within any situation and he was always sensitive to all locations, communities and individuals who were involved in our productions, he is greatly missed. We have lost a true friend and colleague and send our deepest sympathies to his beloved Joanne, Tom and Hetty. A project that gives a voice to young parents living in the urban and coastal districts of East Northumberland using photography and video to tell their stories and reveal the realities of life as a young teenage mum – the good times and the bad – being scared, vulnerable, desperate, depressed but also incredibly optimistic and stoic.